Belgian beers scare some with their higher-than-norm alcohol, but one of my favourites weighs in at a moderate 6.6%. 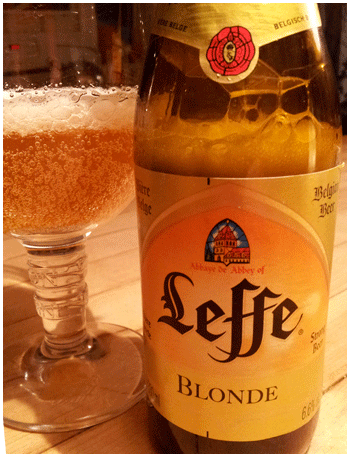 Leffe Blonde has the creamy texture of rich Chardonnay, the yeasty/fleshy smell of Champagne, and the bitter/dirty tang of strong, runny cheese. Also there is a slight sweetness adding a nourishing feeling to the experience. How could you not love a drink with all these characteristics! Best from a big Riedel – sipping as if it were wine. I find it to be the perfect partner for a twenty minute act such as reading mail, paying bills or a few chapters of a book. Or writing a beer review. P.S. Leffe also comes in a Brune edition, which I find a bit too sweet. So hard to resist a corny ‘blonde over brunette’ comment. But I did. Next articleBack on the Bicycle! I first had a bottle of Leffe pressed on me by an ardent Belgian beer drinker in France in the 80’s. I couldn’t get out of bed the next day — really heavy headache. Same thing happened ten years later in Brittany. Maybe it’s just me but I am not an allergic type. Hi Geoffrey, sounds like Leffe is not for you. But odd that it would hit you that hard. Ten pints of Newcastle Brown knocked me out once. But that was volume. Fortunately there’s lots more good beers. Cheers!